Elsa in metallic Python, from the Lisa Kay London collection, a shoes that's simply stunning on the foot with it's V front designed to come up and over the toe joints (no seams). 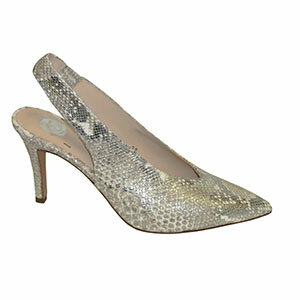 This slingback shoe is fitted with an elastic trim in metallic python enhancing the fit and comfort. It is the ultimate shoe for Mother of the bride or just simply day to evening wear. A Must Have in every Women's wardrobe.